Mary must have been a pretty special girl, don’t you think? To be favored and chosen by God to bear God’s Son, Jesus. I wonder what she did to deserve such favor. You would think that God might have had a list of qualifications that needed to be fulfilled for this job. For example, I would think it would be important for her to have a good financial foundation, so that she could easily provide for the child; have resources, like other women available to assist her; she should be married so that there is no moral or ethical questions; she should be mature and able to handle the responsibility; she should be devout and strict in her religious observance, keeping the law perfectly; she should have a special relationship with God. Can you think of other qualifications that we might expect for filling the position of the mother of the Son of God? In fact several early Christian texts – that did not make it into the Bible – went out of their way to describe such a Mary: a woman who was so pure and holy that she was really only one step in holiness below her son. But this is not the Mary we meet here in the Gospel of Luke. Mary in the Gospels seems to be nothing special at all. She is a poor peasant girl, perhaps as young as 13/14 and certainly no older than 17; she is unmarried at the time of the visit of the angel and there is nothing in the text to suggest that she was particularly devout or that she had any kind of special relationship with God. She is just a normal, 1st century peasant girl, living in a small village, betrothed to an older man and probably (like all young women of this time) looking forward to her life as a wife and mother in this context with the expected mix of both fear and excitement. But she is favored by God! She is chosen! She is blessed! There is, however, something very unique about Mary and it is this: when she is greeted by the angel and told that she is favored by God she accepts and believes it. That seems pretty simple, but think about it. All of the social and religious powers of the time were going out of their way to send the message that you – Mary – are not favored and not worthy. As a woman, a peasant, a villager she would have had 2nd class status and then there was the matter of keeping the law and maintaining the purity regimen. And on top of that she is going to get pregnant before she is married! How in the world could she ever believe that she was favored by God? And what about us? We live in a world of high expectations. Nothing comes free, we must always work to earn everything we have. We believe that we get what we deserve and there are no free lunches. We spend our lives trying to live up to expectations and acquiring and maintaining our qualifications. We spend our lives trying to be worthy. And we extend this to our relationship with God – if you want God to bless you then you have to… Fill in the blank! 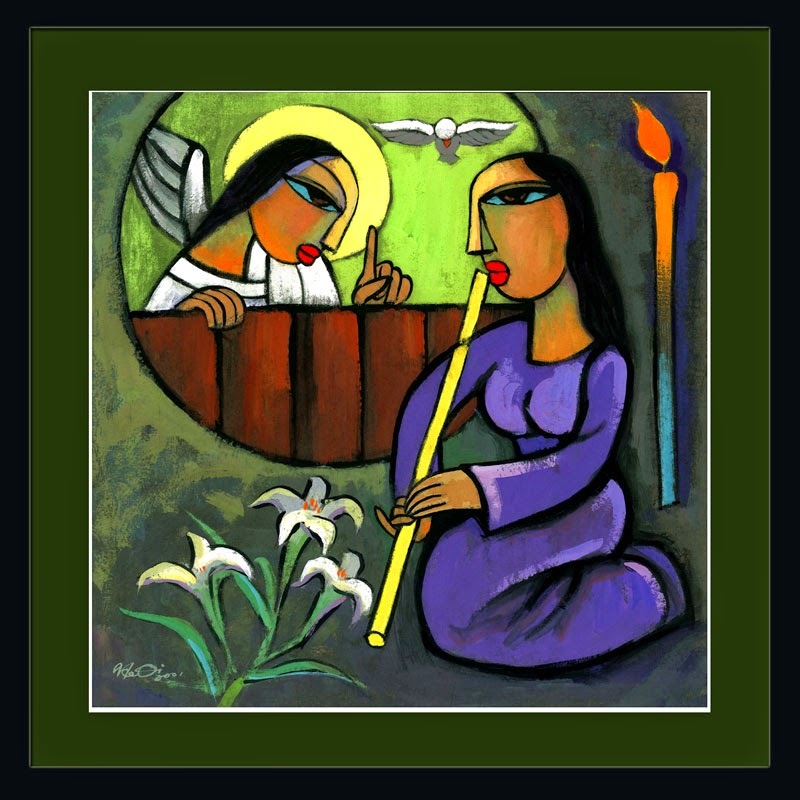 But on this 4th Sunday of Advent we pause to look at this young woman and marvel at her faith. And her most important act of faith is simply accepting the angel’s greeting and believing that yes, she was favored and blessed by God, not for anything she had done or accomplished. God’s favor and blessing come to her as a free, unconditional gift. And believing this enabled her to accept everything else; accepting God’s unconditional favor and blessing empowers her and enables her to do incredible things. This is true for us as well. You are favored by God! Can you believe it? Do you know and believe that God notices you and loves you and this is completely on the basis of nothing you do, but only because of who you are. You do not have to DO stuff in order to attract God’s notice and favor – rather God notices and favors you right now on the basis only of his unconditional love! Quote from "In the Meantime" by David Lose in his essay "Blessed Like Mary."